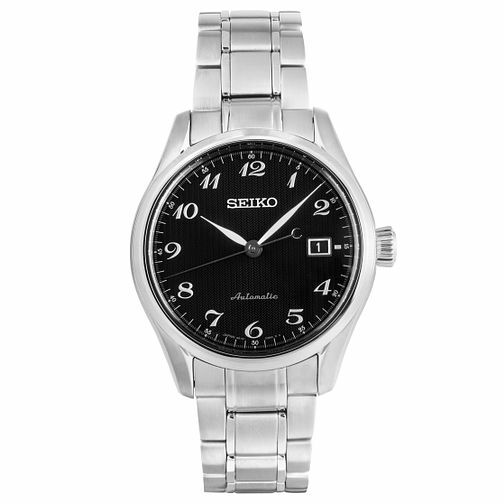 This stylish timepiece by seiko features a 6R27 Automatic movement housed in a 40.5mm case. With bold black dial and oversized numerals, white hands and stainless steel bracelet. From their very first watch in 1913 to the very latest creations of today, Seiko have continuously honed their skills, increased the precision of their manufacturing and developed new ideas and components in their own unique Japanese style. The source of their strength is their craftsmanship. For the purists who appreciate the finest watchmaking, we proudly present Presage. Seiko Presage Men's Stainless Steel Bracelet Watch is rated 5.0 out of 5 by 1. Rated 5 out of 5 by Anonymous from An excellent watch People are chasing the discontinued Sarb 033/035 and 017 and paying through the nose, allowing items like this lovely Seiko Presage dress watch to slip under the radar at the giveaway price it was in the recent sale. 6r15 movement, 100m water resistance and best of all a lovely textured dial, the whole design harking back to vintage Seiko watches. I wasn't the only one who bought. They are sold out now. Very pleased with my buy.